ORANKA. Brand Quality in a beverage system. 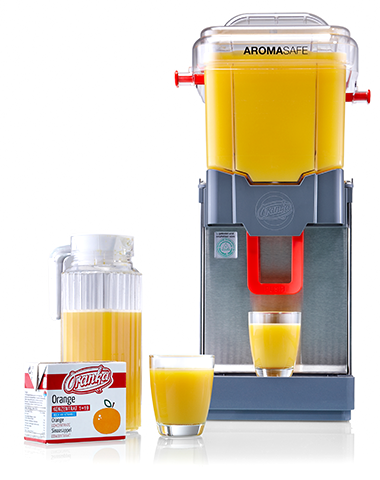 With the ORANKA beverage system you are choosing a fruity and healthy branded product and a new generation of modern, energy-efficient and patented drink dispensers. Numerous patents, continuous development as well as various hygiene certificates and recommendations according to HACCP standards ensure even more product safety and underscore our high standards of quality. As required in the hygiene regulations for food and by the DIN standards10501-2 and 10519, adverse effects on the beverages are excluded from occurring in an exemplary manner due to the protective safety devices of the patented ORANKA dispenser. The lid of the ORANKA tank can be locked. This provides protection from unauthorised access. The extraction of drinks can be safeguarded against outside times of operation. The cooling effect is carried out via the stainless-steel base with assured hygiene in accordance with HACCP. The tank unit can be taken off while still being full, since it is a closed and secured system. All parts can be washed in the dishwasher for efficient hygienic cleaning. Very easy handling without having to use a lot of staff goes without saying. The volume of the tank, mixture ratio and packaging size have been optimally coordinated with each other. This way you can offer your customers or guests refreshing cool drinks around the clock. Our safe cooling system, together with the ORANKA Aroma-Safe and our ORANKA Aroma-Cap systems, ensure that the air seal is maximised and the highest possible degree of freshness guaranteed. The visibility of the drink inside the transparent tank fosters a heightened consumption awareness. For this reason, our fruit drinks are a welcome, healthy and pleasurable experience day in and day out. ORANKA. Fruity and healthy products with hygiene-guarantee.